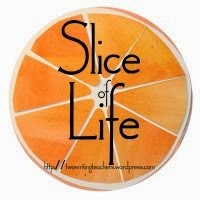 I'm slicing with the Two Writing Teachers community for Day Twenty-Five of Thirty-One of the Slice of Life Challenge in March. Thank you Stacey, Tara, Anna, Betsy, Dana, Kathleen, Beth, and Deb. And, it's Poetry Friday, today hosted by Heidi Mordhorst at her blog, My Juicy Little Universe. Heidi is also sharing a poem for Michelle Barnes' challenge. See the explanation below. Every month, Michelle H. Barnes at Today's Little Ditty interviews a special guest who offered a poetry challenge. This month, this guest is Amy Ludwig VanDerwater from The Poem Farm. Here are Michelle's words about the challenge: "Amy has challenged us to write poems about small things— animals or objects you see everyday and don't give much thought. Click HERE for more details." Amy is a master when writing about small things. I know she sees things I miss, and celebrates them often in her poems. I do try to notice, but often they skip right by. This time I wrote a poem about something my granddaughter Ingrid has noticed. 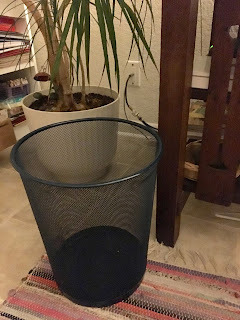 She visits me at least once a week, if not more, and each time she tells me how sorry she feels for the wire wastebasket in my office. All the hours at my house, whenever trash is concerned, she "feeds" this basket, hoping it won't feel lonely anymore. Ingrid is a child who holds many things, mostly living ones, close to her heart, but others, too. She makes sure she visits the extra bedrooms that are not used very much. She hugs the stuffed animals, and pats the large ceramic dog that sits in my living room. I am grateful for her eyes. She notices, as Amy asks, the small things. Thanks, Amy, It never occurred to me that wastebaskets would be lonely, but Ingrid has caused me to look at things in a new light. She visits the extra bedrooms that are not used very much--what an open and sensitive heart! I know. She is very thoughtful. Ingrid has a keen and generous eye! I never thought about my kitchen trash can that way, but it is certainly "ripe for making assorted acquaintances"! That Ingrid's a special one! Her heart is going to take her to some special places in her life... and not just unused bedrooms. 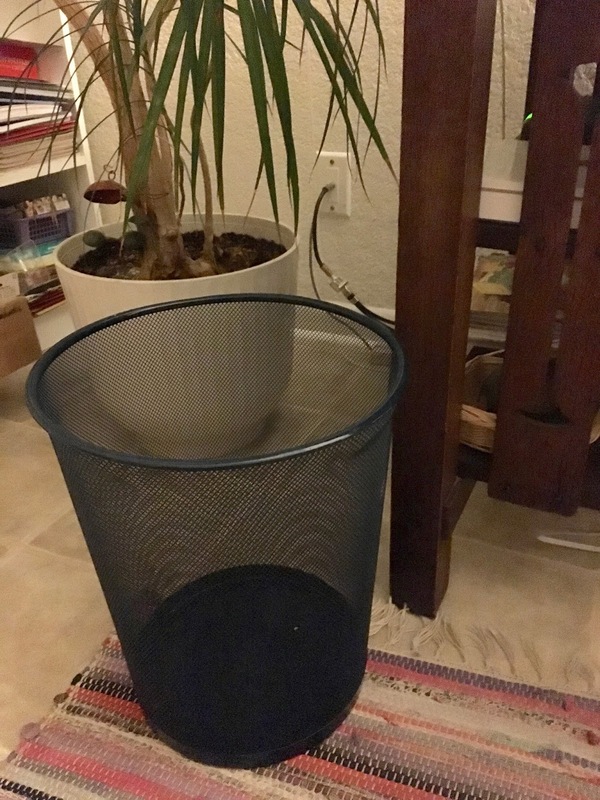 I am grateful to YOUR eyes, Linda, for capturing a small wastebasket's loneliness in such a big-hearted poem! Love the last line especially, that not only pulls the whole poem together, but ends my reading with a smile. Thanks, Michelle, new eyes is one thing that Ingrid brings to me. I'm with Michelle on this one. The last line struck me as being so thoughtful as if the wastebasket was really feeling the pangs of being alone. I am glad to have read this after another frustrating hour with various techs about my continuing issues. Thanks, Carol, I just saw your comment. I hope your tech issues are gone soon! Your slice reminded me of an Estonian children book where a child feeds the wastebasket trash because this inspires the basket to create poetry. Wow, it's nearly the same idea, Terje. How wonderful that there is a similar story. Thanks for telling me. Your poem allows us to see the ordinary through your Ingrid's eyes. Thank you for sharing the poem, and her, with us today! You're welcome, Chris. This particular idea of Ingrid's is one I needed to capture. You're welcome, Irene. It was fun to do. That first stanza is just begging to be read aloud, love the sounds each word makes, but still creates such a vivid picture. Ingrid does have a gentle heart for all things. Thanks, Elsie, yes, she does. It was fun writing this about and for her. As everyone else says, what a special, special little girl! What a big heart!! She touches my heart so much. And by the way Linda, your poem is awesome too ;-)! Thanks, Lynn, and I agree, Ingrid is special. Oh to see through the eyes of a child once again. Who knew a wastebasket has a life. Thanks for spotlighting something we all have in our houses but rarely give any thought to. You are right, never a thought except to 'empty'. Ingrid thinks of this every time, too. Quite a snow you had, Linda! Ingrid might be interested in my poem called "Tactoscope" from Squeeze, which imagines a tool that shows every spot that has never been touched. Ingrid would want to lay her ministering hands, wouldn't she? I will look for the poem, Heidi, exactly the type of thinking that fits. Yes, the snow was huge, & more coming tonight, just a bit though. Thank you so much for sharing the poem and its back story. As much as your granddaughter is a gift to you, you are even more so a gift to her. Oh, to be understood and appreciated, when being sensitive can be derided and dismissed. You and your granddaughter: a match made in Heaven! God bless you both; I look forward to reading more of your shared poetic insights. Thank you again! You're welcome, CB. I am one who shares with the grandchildren, but they are always opening my eyes to new things, too. Ingrid is very perceptive! Better keep her around as much as you can to provide all that inspiration! Isn't it fun, Matt? I'm sure you appreciate this because of the age of your own children. New ways to look! Now we might always think of those baskets in need, whether empty or full to the brim, Jama. Fun to think of yours! I am putting in my wishing hat a request for a granddaughter like Ingird someday. What a treasure! I hope your wish comes true, Margaret. I am lucky to have Ingrid & two other special grandchildren, too. What an insightful and soulful child, Linda. You are both lucky to have found each other. My kids open my eyes daily to things I take for granted. If only we could retain that wonder. Wouldn't it be lovely indeed, Brenda. I guess we do lose much of it as we grow up. Thanks. Love this line: "ripe for making assorted acquaintances." And love Ingrid's view of the world. We need to keep our small hearts available for seeing the little things. Thanks, Julieanne, our view needs widening I think, to look at things in different ways. What an extraordinary noticing by your granddaughter! How dear! Loved this. Thanks, Maureen. Hope the travel is going well. How sweet Ingrid is to worry about an empty wastebasket! I love the idea of words making new acquaintances in there. Thanks for sharing, Linda! You're welcome, Catherine, it was very fun to write. What a caring heart, Ingrid has! So lucky she is to get to spend time with you so often. Love the waiting for work line and the collage of bits in the kitchan can. Thanks, Lee Ann, fun to imagine my dear wastebasket being sad. And yes, Ingrid is such a thoughtful young girl. Precious little Ingrid. I love this line, "Crumpled scraps of abandoned words." I bet you could learn a lot about someone's garbage can. Betsy, de-constructing bags of trash is something I actually have done with students, a simulated archaeological dig. But it never occurred to me to think of a trash can feeling lonely or ignored. What a sweetheart your Ingrid is! Poor lonely wastebasket! Thanks, Carol for the sympathy! Fun isn't it? Thanks, Jennifer. I love your Ingrid's imagination! And a fun poem, too. Thanks, Doraine. Imagination is a great thing, isn't it? How lovely to see your granddaughter's compassion! I love your poem, too. Thanks, Ruth, Ingrid is so thoughtful, she reminds us to do more every day.